On October 7, 2018, I will join Team HFOT in the Bank of America Chicago Marathon! I have committed to raising funds and awareness for Homes For Our Troops, a 501(c)(3) organization that builds and donates specially adapted custom homes nationwide for severely injured post-9/11 Veterans, to enable them to rebuild their lives. Making this effort extremely special is that I am dedicating my fundraising to the construction of a house for the McCardle family in my hometown of Franklin, Wisconsin. Marine Lance Corporal Bobby McCardle, an Infantryman, was on his second deployment serving with the 1st Battalion, 4th Marines, in Iraq, when his vehicle was hit by an improvised explosive device (IED). The blast resulted in the loss of his right leg, internal injuries, and a traumatic brain injury (TBI). The donation you make to support me will help Bobby, his wife Stephanie and their children rebuild their lives in a specially adapted home. You can be assured that your donation is put to good use because Homes For Our Troops has received a high rating from Charity Navigator. Nearly 90 cents of every dollar donated goes directly to program services for Veterans. We love our vets! thanks Paul for doing this fundraiser. Go Paul!! How cool to run such a great event for such an incredible cause! I hope you have the best time in Chicago! Great work Paul. Best of luck at the Marathon and May God bless the McCardle family. What a worthy cause. Thanking the troops for their service to our country as they deserve. My company will match this donation as well. Thank you for your service Bobby. May your family dreams be fruitful! Great cause and we all appreciate your efforts! May you receive all the assistance you need for this project ?????? Thank you, Paul, for supporting this wonderful organization and for sponsoring one of our country's real heroes. Thank you for your dedication and selflessness in serving our country! We are so grateful to you and wish you and your family many, many years of joy and happiness in your new home. Our very best to all of you and thank you again! Our sincerest appreciation for your service and sacrifice! Best wishes for a smooth run and successful build. Thank you. Wishing you a great run in support of your new "neighbor" Bobby! Great cause! Best wishes for a successful run. Paul - Thank you for your continued support of our troops! 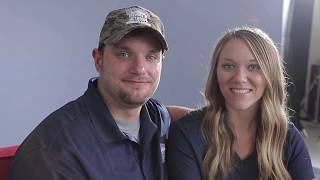 Bobby & Stephanie - Our country can never thank you enough for your dedication and service!! Thanks for supporting the military, as this is near and dear to my heart growing up as an ARMY brat! What an amazing cause. Best of luck with your training and run! Paul, what a wonderful family and wonderful cause. Our Veterans deserve the very best. Thank you for your proud service to Bobby and Stephanie. Keep running Paul. Great cause - happy to help. Best of luck on your run and raising funds for a great cause! Rooting for ya. Great job Paul. All the best Bobby. Thanks for all you've given. Thank you for your bravery and sacrifice. May God bless you, your family and your new home.